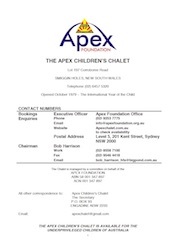 Please refer to http://www.apexchalet.com.au/information-participating-groups page for details of changes to booking rules for 2021 onwards. Note: You might like to first scroll through the calendar below to check when the Apex Chalet is available. This is a request for reservation. All reservation requests will be manually reviewed and you will be notified shortly.